Tony Judt decided to write Postwar in 1989, the year the collapse of the Soviet Union provided European history with a rare example of a clearly-signposted ‘end of an era’. 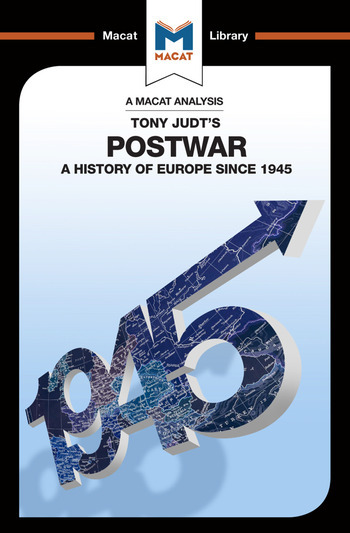 It's scarcely surprising, then, that the great virtue of Judt's book is the clarity and the breadth of its account of postwar Europe. His book coalesces around one central theme: the idea that the whole of the history of this period can be explained as an unravelling of the consequences of World War II. A bold claim, but Judt’s exceptional ability to create strong, well-structured, inclusive arguments allows him to pull it off convincingly. Judt’s work is also a fine example of creative thinking, in that he excels in connecting things together in new and interesting ways. This virtue extends from his unusual ability to combine the best elements of the Anglo-American and the French historiographical traditions – the latter informing his strong interest in the importance of cultural history – to his unwillingness to allow himself to be constrained by historical category and ultimately to his linguistic abilities. Postwar is, above all, a triumph of integration, something that is only made possible by its author's flair for creating strong, persuasive arguments. Dr Simon Young holds a PhD in History from Cambridge and now teaches at the University of Florence. His research focuses chiefly on the traditions of English and Irish Popular Literature.